Hey everyone I know it's been awhile since I posted but had to let you know about this great free plugin from Eventide called the UltraChannel. I love Eventide hardware and have heard good things about their software. Fellow engineer and blogger Christopher Smith posted it on his Google+ Recording and Mix Engineers group (Thanks Chris). 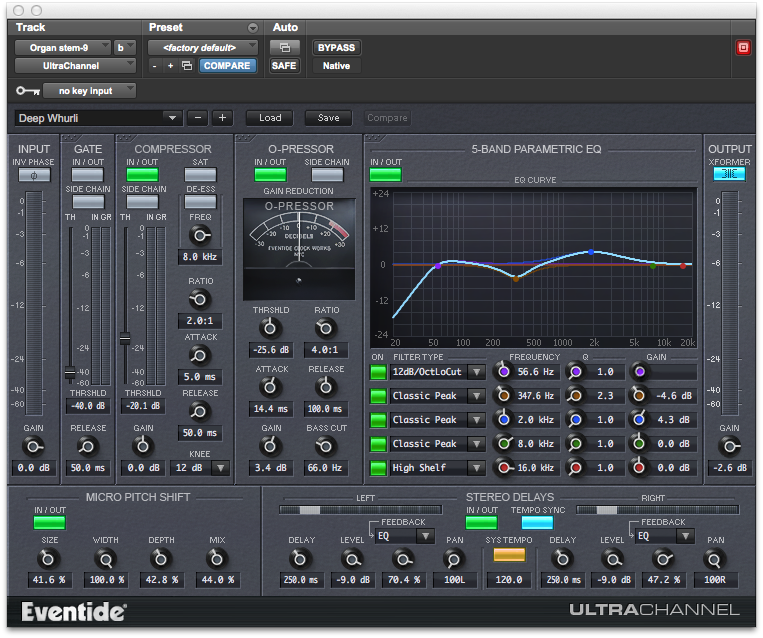 "The Eventide UltraChannel plug-in is a powerful audio engineering plug-in for Avid AAX, Apple Audio Units, and Steinberg VST formats. It provides you with a routable Gate, Parametric EQ, and two Compressors, a Micro Pitch Shift section, and Stereo Delays. Their flexible modular design accommodates different signal processing routing, their graphical displays provide you adept precision in frequency adjustment, and their suite of controls give you a near infinite number of ways to generate exactly the tone and frequency characteristics you’re seeking. Additionally, through its support for side-chaining, you can use an alternative audio source to color the characteristics of your main signal. Whatever your audio application may be, UltraChannel will be invaluable for its remarkable versatility and industry benchmark performance." The above pic is the setting I used for an organ track in a recent project. It's very convenient having all those features in one plugin that's light on CPU usage (see video below). I plan to do some more intensive testing with the UltraChannel but so far it lives up to Eventide's reputation. NOTE: It's free till July 8th 2014 after that it will cost $249. You can get more info and sign up to receive a download link on Eventide's webpage. An access code is required and can be found on ProtoolsExpert's website or at the end of the videos on the Eventide site.